Recipe 98: This is a quick and easy pasta for everyday lunch or dinner. You won’t need more than 10 minutes, basically just the time to cook the pasta! Ingredients for 2 people: 250 gr of pasta (it’s better short pasta), some pesto sauce ( I normally use the Sacla’ one you can find everywhere here in London. Then one day i will also add my mum’s recipe to make it at home! 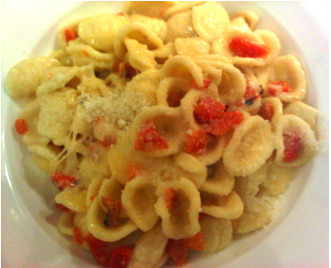 ), some cherry tomatoes (6-8), olive oil, garlic, salt, Parmesan and pepper if you like it. Put some water and salt in a baking pan and let it boil. In another pan, put some olive oil with some garlic in pieces. Let them cook a bit so the oil will take the flavor. I then normally take the garlic out, but if you like it you can also leave it in the sauce. When the water will boil, you can add the pasta and let it cook for around 10 minutes (depending by the pasta, but take it out one or two minutes before the time written on the bag) . 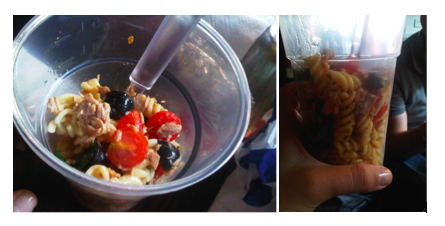 Cut the cherry tomatoes in 4 and put them in the oil. Let them cook a bit and add some pesto sauce (2-3 spoon). Mix it all and when the pasta will be ready, drain it and place it in the pan with the sauce. If you can add also a bit of water from the pasta, this will be better for the sauce. Mix it all and add some other pesto sauce until it is enough for all the pasta. Finally put some Parmesan and mix again. Serve in the plates and add some black pepper. PS. 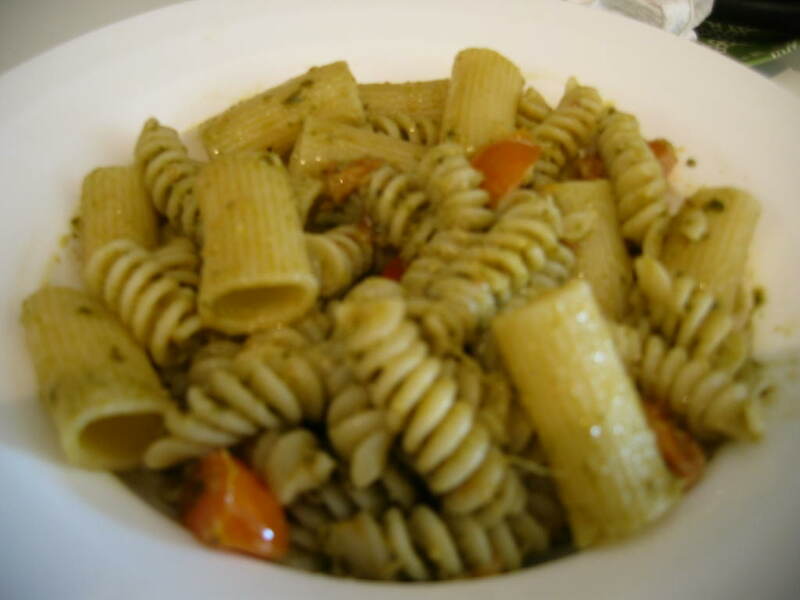 Mamy siccome io sono una patita del pesto e questa e’ la ricetta favorita di Anna, appena ci siamo trovate a cucinare insieme, abbiamo deciso di preparare questa pasta…. anche per uscire dal solito semplice piatto. Nella sua semplicita’ questa pasta e’ buonissima. Certo magari la prossima volta metto anche la tua ricetta del pesto…con quella si che verra’ veramente squisita!